Free Form™ Habitat™ Black Product Information | Smooth-On, Inc. Specific Volume 17.3 cu. in./lb. Free Form™ Habitat™ Black Epoxy Putty is a mix-by-hand putty that is used to create textured or highly detailed display pieces. Habitat™ Black is solvent-free and contains no VOC’s. Working time is 60 minutes and cure time is 16 hours at room temperature (73°F/23°C). Epoxy cures to a very hard, heat resistant material that is easily painted. Use with Habitat™ Black Folding Powder – fold powder into epoxy putty to thicken and reduce sag when applied to a vertical surface. Folding Powder also reduces stickiness and makes the epoxy more handle-able. Habitat™ Black is suitable for interior and exterior use. 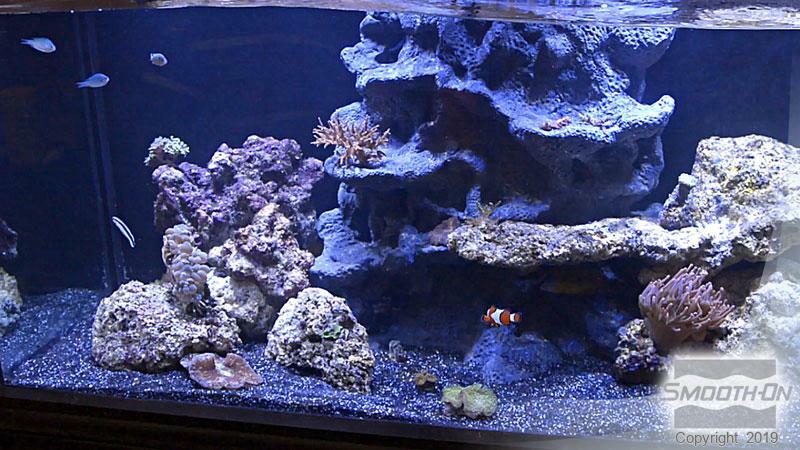 It is certified ‘aquarium safe’ and used by aquariums to create hyper-realistic coral and other aquarium displays. 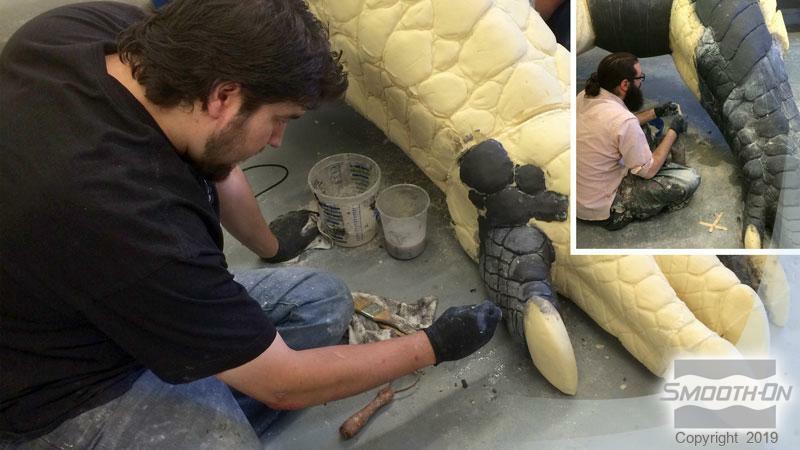 Habitat™ Black is also used for general sculpting and theming applications. Once putty is applied, it can be stamped with a silicone rubber stamp to create repeating patterns with intricate detail over a large surface area. Surface can be smoothed with alcohol or water. New Habitat™ Black will bond to cured Habitat™ Black without delamination. Habitat™ Black will not melt foam, and can be used as an EPS foam coating. 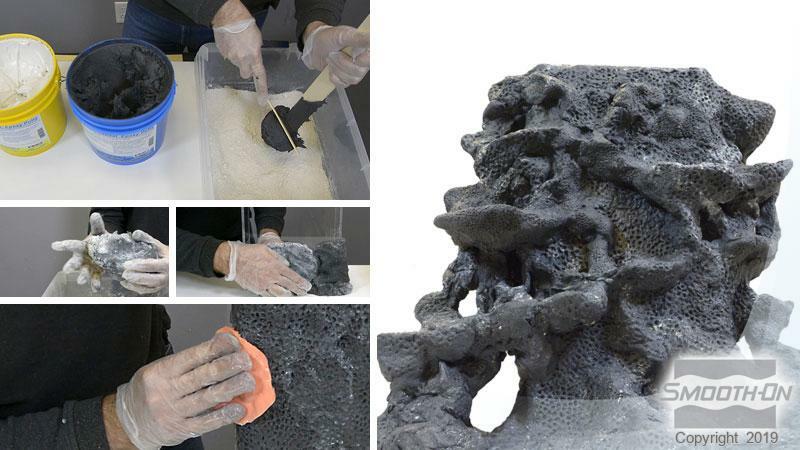 Free Form™ Habitat™ Black is also an excellent repair cement and bonds permanently to itself, PVC, Plexiglas™ (acrylic), wood, many metals, plastics and foams. 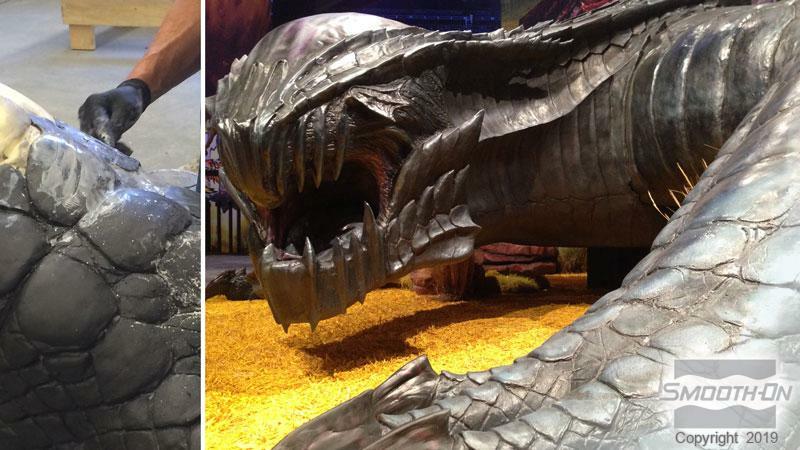 Frank Ippolito and his team apply a coat of Free Form® HABITAT® over a metal and EPS foam form to create this life-size Gore Magala dragon sculpture for E3 2014. Aquarium overflow made with Free Form® HABITAT®. Free Form® HABITAT® was used to create this diorama. 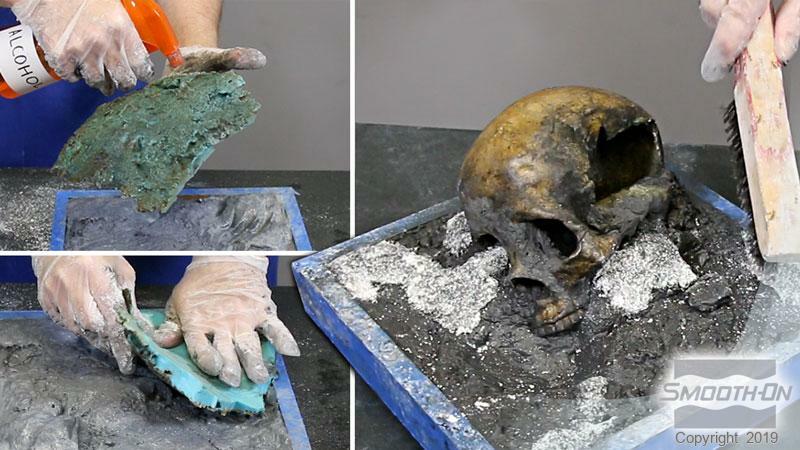 The epoxy can be texturized and sculpted using water or alcohol and a silicone stamp. Rate Of Coverage - Assuming a thickness of 0.25 in. (6.3 mm), 1 lb. (454 g) of Free Form™ Habitat™ Black will cover approximately 71.6 in2 (462 cm2). Measuring - Free Form™ Habitat™ Black comes as two parts. Dispense equal amounts of Part A and Part B. These products have a limited shelf life and should be used as soon as possible. Curing and Heat Resistance – Habitat™ Black will cure in 16 hours at room temperature. Elevated heat will cure epoxy faster. At an ambient temperature of 150°F/60°C, the material will cure in as little as 30 minutes. A heat gun may also be used, as long as the surface temperature of the Habitat™ Black does not exceed 212°F/100°C. 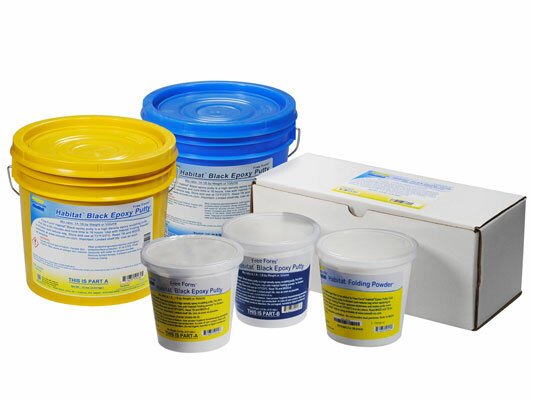 Putty cured at room temperature with a minimum thickness of ½” (1.27 cm) will resist temperatures up to 165°F/74°C. 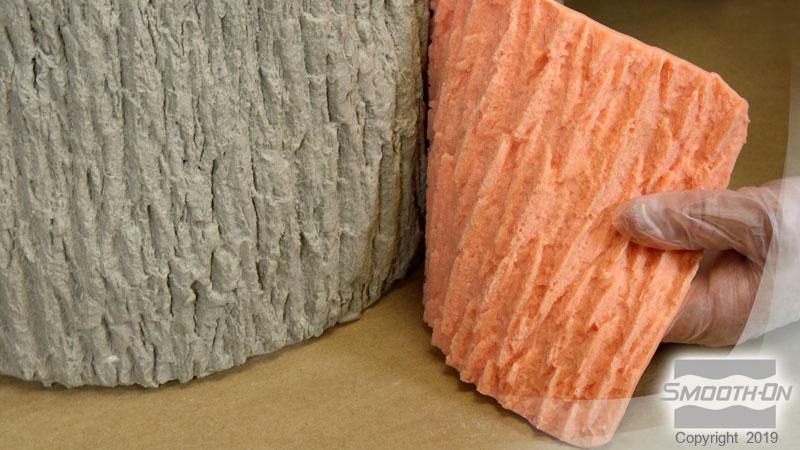 Post Curing - For higher heat resistance, cured Habitat™ Black can be heat post-cured in a dedicated industrial oven. Cure at 175°F/80°C for two hours, followed by three hours at 212°F/100°C. Thin sections may need to be supported during post curing. Allow material to cool to room temperature before use. Machining – Cured castings are rigid and durable. They resist moisture, moderate heat, solvents, dilute acids and can be machined, primed/painted or bonded to other surfaces (any release agent must be removed). If machining cured Free Form™ Habitat™ Black plastics, wear dust mask or other apparatus to prevent inhalation of residual particles. Painting – Cured Free Form™ Habitat™ Black can be primed and then painted with acrylic enamel paints. Let paint fully dry before putting part into service. 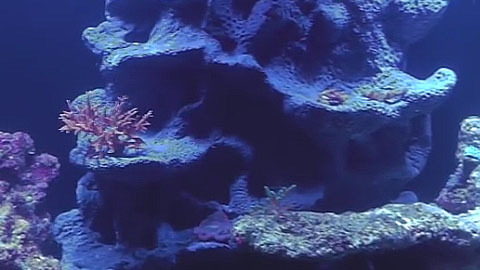 Removing Uncured Free Form™ Habitat™ Black - Remove as much uncured material from the surface as possible. Clean any residue with soap and water. Optional - Use E-POX-EE KLEENER™ available from Smooth-On. This video shows how to create a silicone stamp from a piece of coral that can then be used to create detail. 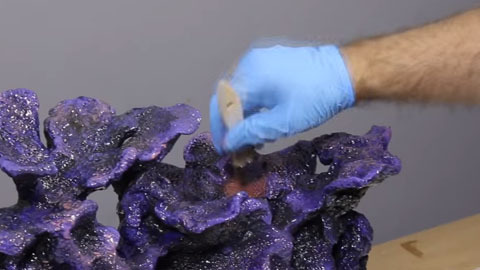 This video shows the process of using Smooth Cast™ 327 urethane resin to paint an aquarium background. 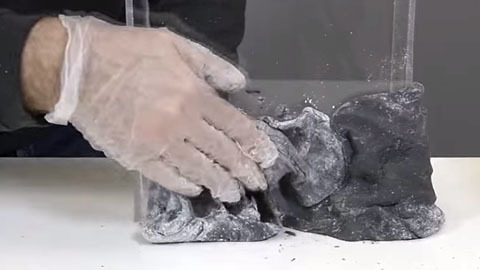 This video shows how to use Habitat™ Epoxy Putty to create a sculpted overflow cover for an aquarium. Free Form® Habitat® epoxy putty and EpoxAmite® laminating epoxy are used to repair a fiberglass overflow tank.